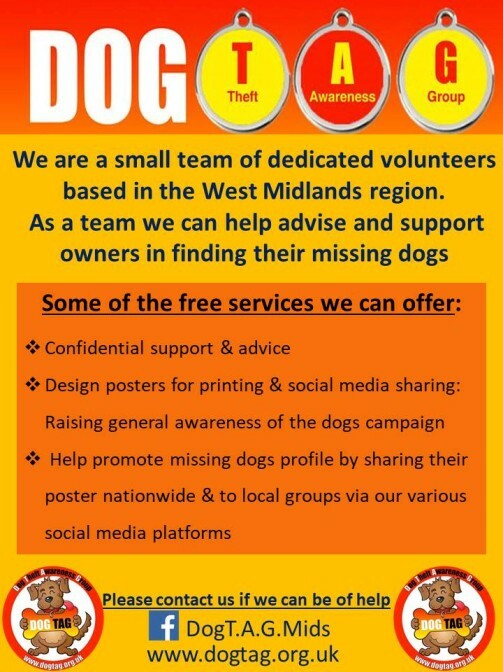 We organise regular non-profit Dog T.A.G events and promotions to highlight "the serious issues of dog thefts" and local missing dogs in a variety of ways. Awareness events to help owners take steps to prevent dog theft occurring and ways we can keep our pooches safe. Fundraising events to help raise donations and awareness of local dog rescue centers to assist in the the promotion of dogs waiting for their forever homes, monies for Vet fees, dog food, toys, blankets, disinfectant, neutering fees etc. Help design posters for local dogs lost and stolen which can then be printed off and also shared on social media sites to raise general awareness of the dogs' campaign and any related information associated with them to help assist with their return home. We have our own insured and qualified microchip implanter offering competitively priced microchipping at our events. IT IS NOW LAW that all dogs are microchipped. Organise and attend regular family fun days out with the fur-babies and at the same time increase the public profile of missing dogs in the area, dog welfare and dog safety. Regular updates and advice relating to dog safety and the sharing of information pertaining to local dogs missing via our Facebook and Twitter pages and our supporters.